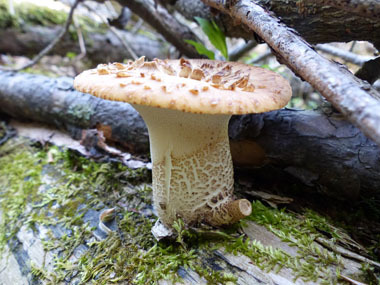 Overview: The disappointed morel hunter is usually never totally blanked as there are (typically) many dryad's saddle to be found. Foragers enjoy this edible springtime fungi as it is relatively common but depending on its age they become quite leathery making it virtually impossible to use in the kitchen. Dryad's saddle are much easier to find than morels because they stick out as shelves from the lower portion of dead tree trunks. First described scientifically in 1778 by English botanist William Hudson (1730 - 1793), who named it Boletus squamosus, this species was renamed Polyporus squamosus by Swedish mycologist Elias Magnus Fries in his 1821 Systema Mycologicum. Distinguishing Features: Individual caps grow anywhere from 10 to 60cm in diameter (4 to 24”) and can get to 5cm (almost 2”) thick. Often in tiers, the caps are attached to the host tree by a short lateral stem that darkens towards the base. They are variable in outline but generally are semi-circular, kidney-shaped even fan-shaped. 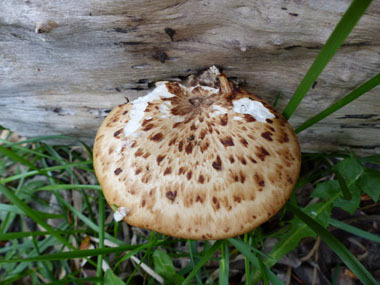 Dryad's saddle is broadly convex becoming flat, and can be slightly or deeply depressed. They are typically pale tan with an overlay of large, flattened, brown to almost black scales. 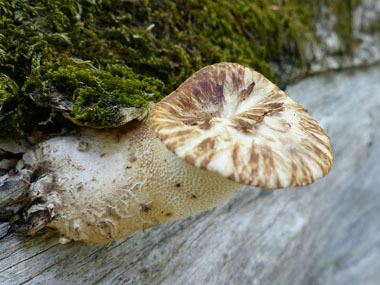 Height: This fungi does not have as much height as it has a broad width. 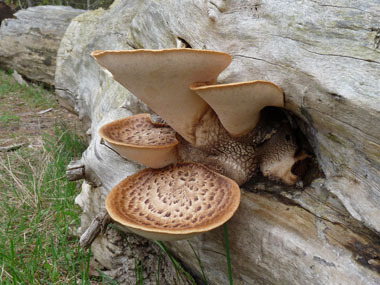 Dryad's saddle typically has a 6 cm (2.36”) stem that is attached to the wood and is up to 4cm (1.57”) thick. 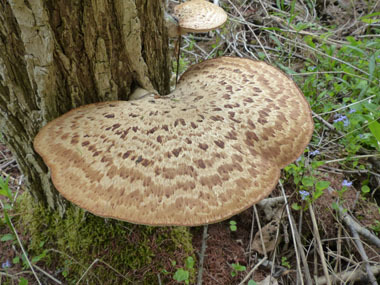 Habitat: Dryad's saddle grows saprotrophically on fallen logs and tree stumps. It can also be found growing parasitically on hardwood trees such as maple, elm, box elder and other deciduous trees. It is a white-rot fungus that causes decay in the heartwood of living trees. They will be found in the same locations every year until the wood is consumed. They are commonly found in many areas across Canada and the U.S as well as in several European countries, Asia, and supposedly (although rare) in Australia. There are no distribution maps that I have found that can pinpoint exact locations of this fungi so on the map that appears with the images, locations are approximate. Please check with local resources for specific locations. Spore print: Tubes are small in the early stage of growth becoming fairly large and angular running (somewhat) down the stem. They are oblong-ellipsoidal and smooth (10-15 x 4-5.5µm). Spores are whitish to yellowish tan. Season: These are typically found in April and May but occasionally they will fruit later in the year. 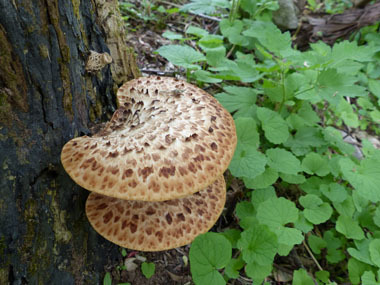 Edibility: Dryad's saddle is best when young and tender. So long as more mature specimens have white flesh they can be collected, dried and powdered or broken into very small pieces for use in soups or stews. The best rule to follow is to use your foraging knife and if you find that it is tough to remove it, then leave it. 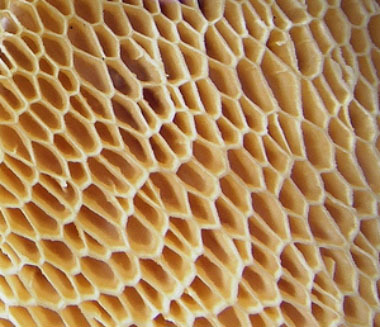 Younger dryad's saddle can be roasted or sauteed. They must be cooked before consumed. They have a mealy odour and taste, yet it is pleasant. Other name: Pheasant Back Mushroom.